The process of planning a camping trip can involve many logistical factors and pain points, such as transportation, food, campsite reservations, rental and use of proper equipment, and climate. In this project, my team and I took the problem of the existing camping trip planning process and design a solution that would make it more centralized and streamlined. How can the camping trip planning process be improved so that group members are better able to organize logistics? We began our research by visiting REI in San Francisco to talk to campers in person regarding pain points in the trip planning process. 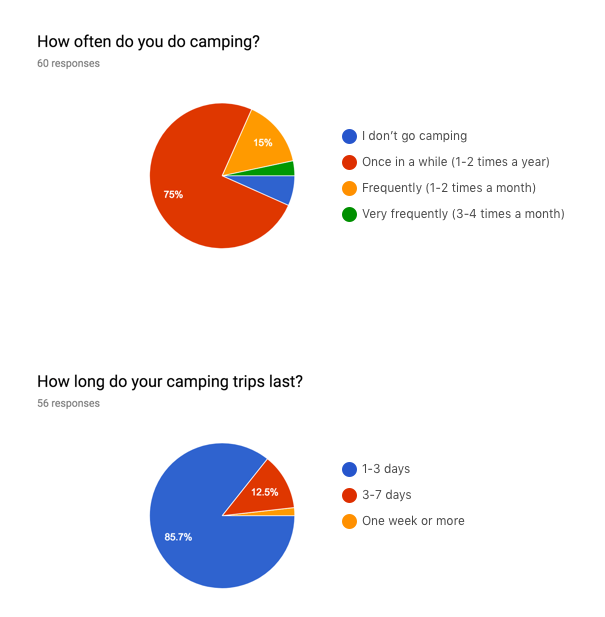 Then, we created and distributed an online survey that gauged participants’ overall camping preparation experience, as well as any potential pain points and how they approach booking sites and acquiring equipment. A total of 60 individuals took the 12-question survey, with 20-25 being the most common age range. The survey starts by asking some general questions about camping habits, then gets into the specifics of equipment usage and rental. More participants consider the camping trip planning process to be neutral-negative than positive. Therefore, these findings led us to start thinking about taking our solution in a direction that would be geared towards creating a centralized source for organization and communication, as well as equipment lending/borrowing. The user persona was created from the combined key findings from my team's surveys, interviews, and research. This persona is meant to represent how a typical user of the product may think and behave. This user flow demonstrates how a new user would approach all of the app's functions. Below is a walkthrough of highlights of the final mockup. This is the first screen the user will see when opening the app for the first time. The user is encouraged to log in with Facebook, but they can also create an account using their email address. This page shows the user a high-level overview of their upcoming and past trips, if any. The main call to action is to create a trip. If the user decides to create a trip, they get directed to a page in which they can enter all of the essential details. 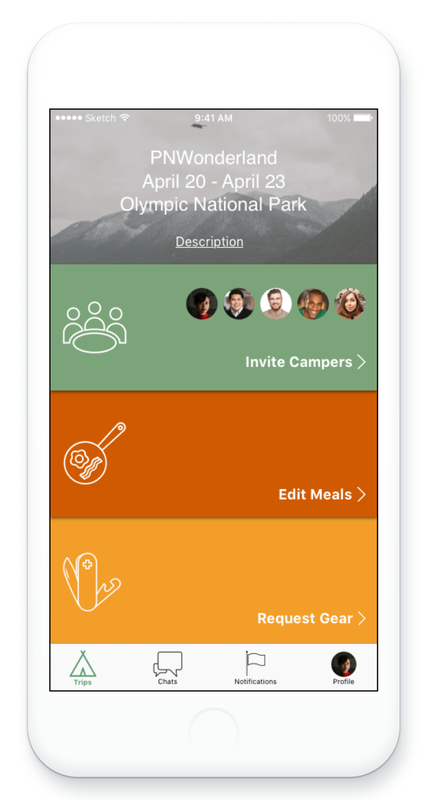 Each trip has a dashboard page, in which campers can collaborate on meals and gear requests, as well as view the guest list and invite more campers. 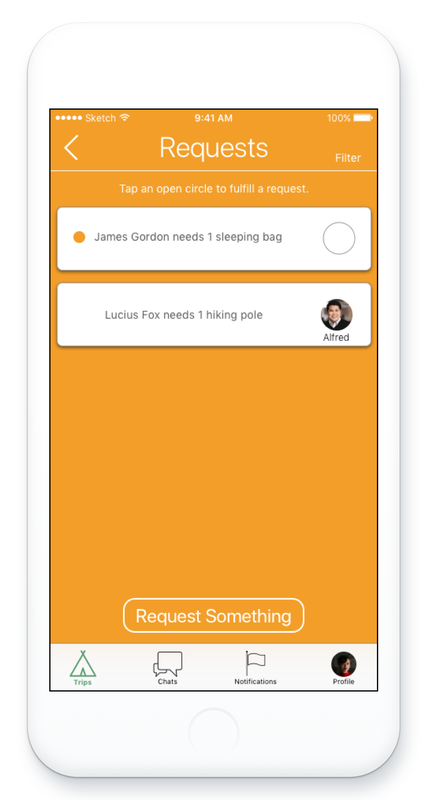 On this screen, campers can fulfill open requests, see fulfilled requests, or request equipment themselves. Campers can either enter food items they want to be brought, volunteer to bring items, or both. 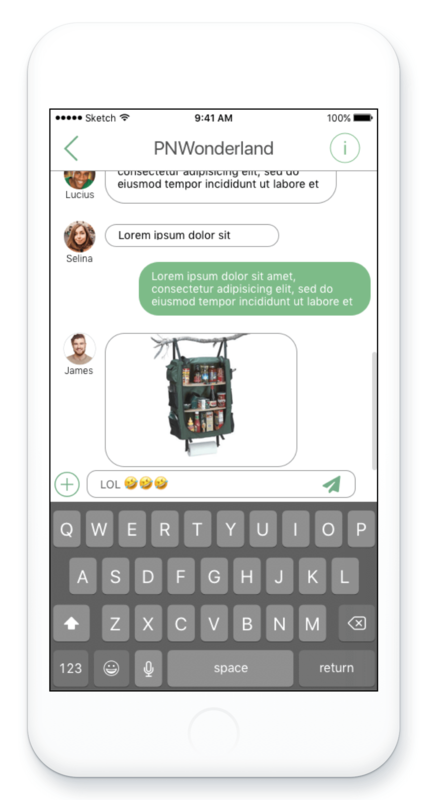 Campers will be able to communicate here. Threads are organized by trip. I learned that more people are working on a project doesn’t necessarily make it easier, and that flexibility is key when working in groups. I also learned that doing wireframing and visual design is difficult if I can’t visualize the final flow. Finally, I learned to let go of ideas that I get attached to.